I received a copy of this book for beta reading and a fair review. I’ve become particularly attached to this story as time has gone by. I read Rise of the Prince and Mad Water some time ago. After a while, I found myself reading the prequel to the series because I didn’t have any continuing story to turn to. 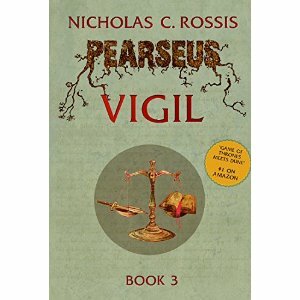 Fortunately, Nicholas Rossis is a diligent writer and we now have the third full book in the series. Compared to the other books in the series this is an all-out action adventure story. The political games have all been played and in this volume the characters are forced to fight for what they believe in or lose it all. The author did a good job of wrapping up the outstanding story lines–even some that I didn’t realize would need wrapping up–and that added a great deal to the overall story. All of my favorite characters were back in the action. There was plenty from Moirah, Lehmor, David, Sol, the Old Woman, etc., as well as the host of opposing forces. The action carried on right to the end. I enjoyed it very much and was happy to not be left with a bunch of lingering questions with regard to what became of the characters. Overall, this was a satisfying read and I look forward to more stories from Mr. Rossis in the future. The whole set is bundled for under $4, which should make it easy to catch up if you haven’t read the previous volumes in the series. Next up is The Legacy Human by Susan Kaye Quinn. I missed the March 2nd release date that I was hoping to get a review in for, but I’m excited to read this new book from Ms. Quinn. I enjoyed the Mindjack Trilogy that she wrote previously and thus far The Legacy Human is shaping up pretty well. I’m glad that I’ll have some time to curl up with it and read this weekend. Anyway, I hope everyone is having a great week and has a great book somewhere handy. You’ll be pleased to learn that the final book in the series (temporary title: Endgame) is currently being written. It deals with the Capital’s invasion of Anthea, and should wrap up the remaining plotlines. Hopefully, it will be published in the summer.